We’ve had a festive feast of ads all featured around John Lewis. What fresh madness is this?! I’m pretty sure the copywriting fun hasn’t stopped there either. Who’d have thought, the baby Jesus is well and truly out of the crib and has been replaced with a piano. But what an end line! I waited with bated breath, going, “So what? so what? hit me with your killer reason for visiting JL, JL.” And they did! Like Arthur Fowler in an Eastenders Christmas special, they hit me full in the face with a frying pan (or piano, in this case). Mais bien sur! Oh how we congratulated ourselves. Who’d have thought they’d pull that one out of the bag? Bravo, Adam & Eve DDB. Bravo. On brief, on brand and maybe on budget. And like their clever copywriter and art director, Twitter have also had some fun with it. 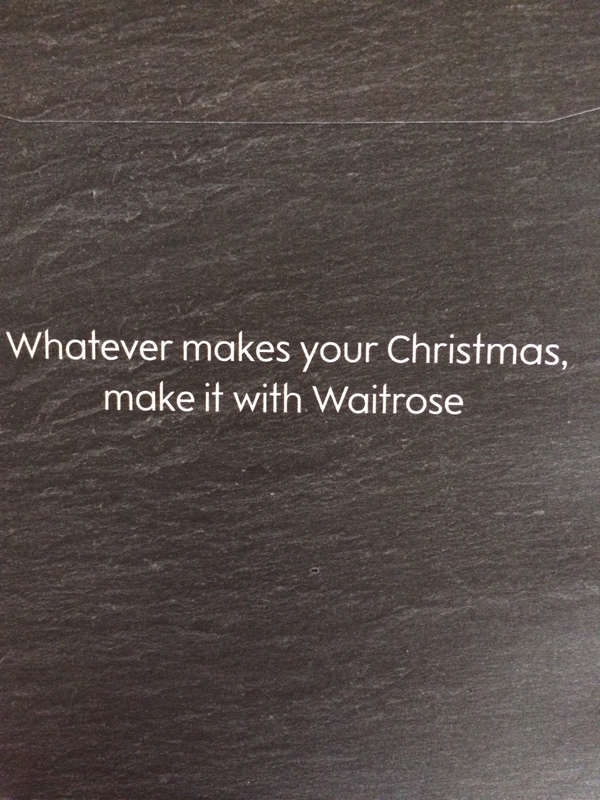 Waitrose, however. We like the humour. But you’re not Aldi or Lidl. You’re the premium one. Stollen is well placed, so maybe that begins to work. But their advert does feel slightly off brand – is the tone of voice right? We’re not sure. It’s certainly a departure from the ordinary, we’ll give you that. But it does feel a bit too Elton this year, know what I mean? ‘Stelton’ with a little whiff of 1970. Naturally, I only ever talk about these two brands, because I have ideas above my station. Like being posh. Marks and Spencer left me a little cold with their Holly Willoughby rummaging around with a plug socket. That’s my recall of it anyway. Sainsbury’s, well we can mention their nativity because it’s just like the last John Lewis ad. But the good news is, they’ve ditched the orange and black for real life. I can’t be doing with that. Bah copywriter. Meanwhile, Kevin the carrot was back for Aldi. Now I didn’t like the ‘pee’ language last year, being the Mary Whitehouse mother that I am. But this year is working better. Right in the nuts gag and, get this, Santa with his sleigh! Now you’re talking. We won’t say anything about the evil parsnip’s dodgy French accent. Is this a nod to Brexit? Well baby, it works for me. Because let’s face it, brands are having a hard time moving away from the whole B word. Let’s hope we get greater creative spirit for Christmas this year. This year seems to have seen the standard of creative work go down. Not sure anyone knows how to write a radio ad anymore, that’s for sure. Marketing Week names the Heathrow Bear ad as the top ad for Christmas. Not sure why Heathrow has to advertise, surely it’s just one of those places that attracts footfall. But who cares, not this copywriter and certainly not gen pop. It’s been voted the best Christmas advert this year. The proposition is one that’s really clear from where I’m sitting – oh to be the copywriter working on that brief. Lovely jubbly. The good news is, this year’s sackful of creative adverts seem less divisive that the other stuff that’s whirling around this winter. So here’s to a peaceful Christmas and let’s hope a very happy new year. It’s that time of year, isn’t it? No, I don’t mean the lurgies, I mean the endless comparisons between Christmas adverts bursting forth on our screens. Unavoidable clashes of colour, noise and sometimes, if we’re very lucky, daring marketing decisions. Storytelling is always key in copywriting, and using literal fabled characters from children’s literature only brings this into sharper view. So should we judge an ad by its budget or by its familiarity (as many of us dust off our childhood copies of Mog), or even by its ability to make us cry? That’s the beauty of a good story, isn’t it? We make of it what we want. Who doesn’t love a big idea? But what feels really clever to me, is a killer line. Not a shoehorned line that happily matches up to a big idea, but a line that was born with the idea. I like to see a copywriter taking their idea by the adjectives, the sleight of hand, the alliteration or the very punch of that eureka moment and turn it into something fantastic. An ad is only as good as its proposition of course; there are lots of other stars that must align to make it brilliant, like the strength of the agency, the marketing department, compliance, budgets, lead times and so on. Anyway, that said, people have to like what you make. Curry’s gives you Jeff Goldblum. It’s real, punchy, direct and, dare I say, funny. I’ve put a Jeff G on my list. Everyone should. This is the follow up from last year’s trenches advert for Sainsbury’s. Last year, we were supporting the Royal British Legion, this year it’s Save the Children. Cue massive shoehorn time – perhaps they borrowed one from John Lewis? Simple, catchy, festive. A great family tune AND a killer line. Nice work Aldi. Nice line as lines go, but is the insight actually quite right? I mean, really right? The link I made is that we need to spend money to show people we care, and quite frankly, that doesn’t sit so well. So…no prizes for guessing the ad. What do you think, fair reader?! Any more great lines out there? Feel free to share and comment below. Meanwhile…Happy bloomin’ November!